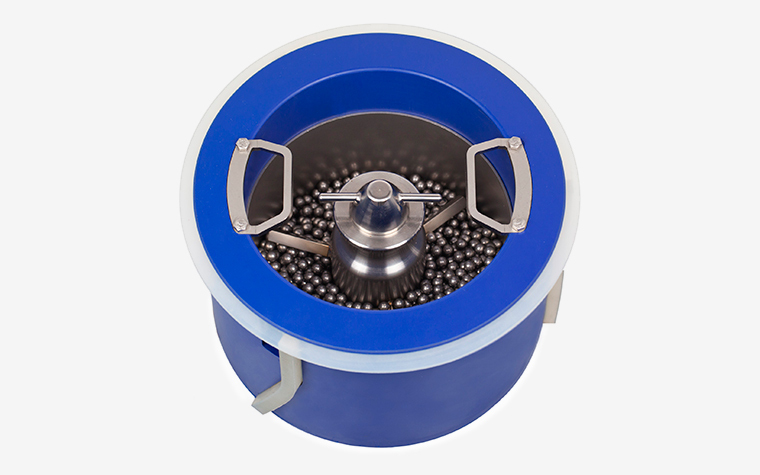 Bilia is a spherical refinement system designed to be used in conjunction with the Qbo - Universal Processing System series. With Bilia, it is possible to make Spreads, Anhydrous Cream, Pastes for Ice Cream/Confectionery/Chocolate with Hazelnuts, Almonds, Walnuts, Peanuts, Pistachios, Pine nuts, Sesame and Coffee pastes. It is also possible to make water-based gastronomical and spreadable sauces combining the operations of cooking and cooling to the refining process. For example: Mustard, Ketchup and cream cheese. During the working cycle, it is possible to set the precise temperature of the product to avoid undesired heating of very delicate products, and cook during refining phases. Moreover, thanks to Qbo technology, it is possible to execute processes without air (vacuum) to make high-quality storable products. Air recirculation inside the product avoids the use of pumps and other complex-maintenance systems. Changing from one production product to another is no longer a problem! Thanks to the technical solutions introduced with Bilia, working operations are extremely simplified with regard to traditional systems. It is now possible to change the type of product quickly and reduce costs.